This letter from Leonard Bernstein was sent to Aaron Copland in October of 1938. The letter was written in response to Copland’s El Salón México. It is important to note the effect that Copland’s piece had on Bernstein and how it reflects views of music during the time. One of the first things that Bernstein mentions is how Copland’s music got stuck in his head. He is also able to easily notate the opening theme of El Salón México. 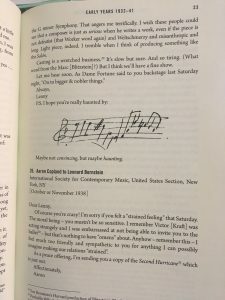 This goes to show that Copland accomplished music writing that was simple enough to be remembered, and he incorporated themes that would recognizable. 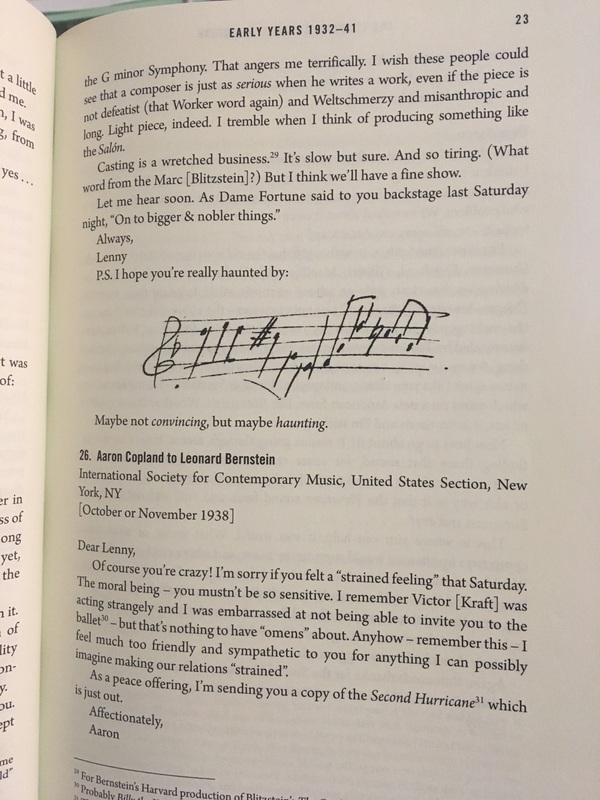 Bernstein acknowledges that he admires Copland’s work and calls him a “master in America.” Copland’s simplified style of this time period is well-known as Copland’s own sound as well as an American sound. Copland was working to move contemporary composition from appealing to a select few towards appealing to the masses. It seems that Copland accomplished this with the success of El Salón México and other works. In fact, Elizabeth B. Crist argues that Copland’s El Salón México was able to project political ideologies onto the concert public. Crist acknowledges that, the ideological dimensions of Copland’s works have been generally lost within the music’s enduring success, obscured by the legacy of anticommunist historiography and its formalist reification of art.” Bernstein focuses on Copland’s technique and the “solid sureness of that construction.” This makes me wonder more about Copland’s other non-musical intentions. Crist, Elizabeth B. 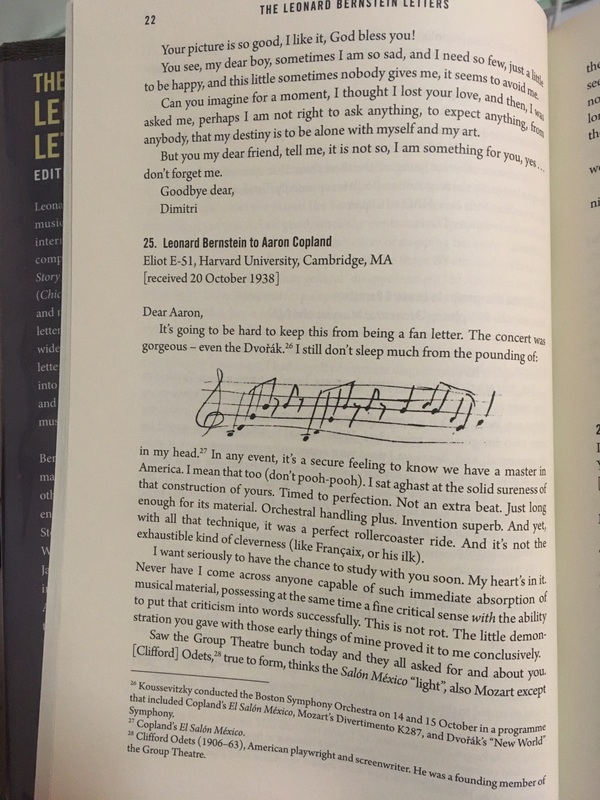 “Aaron Copland and the Popular Front.” Journal of the American Musicological Society 56, no. 2 (Summer 2003): 409–465. Pollack, Howard. “Copland, Aaron.” Grove Music Online. Oxford Music Online. Oxford University Press, accessed November 7, 2017, http://www.oxfordmusiconline.com/subscriber/article/grove/music/06422. Simeone, Nigel, ed. 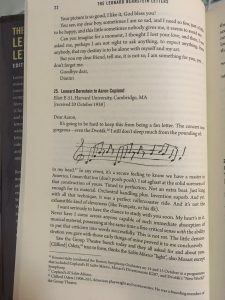 The Leonard Bernstein Letters. New Haven and London: Yale University Press, 2013. This entry was posted in Uncategorized and tagged Aaron Copland, correspondence, El Salón México, Leonard Bernstein by Grace Kenny. Bookmark the permalink.